To mitigate carbon emissions in the atmosphere, researchers have turned to sinks—reservoirs that accumulate and store carbon such as tropical rainforests, but also including a variety of terrestrial plants as well as oceans. However, another lesser known but very large carbon sink is located along the earth's soft-sediment shorelines. Coastal seagrass ecosystems cover some 200,000 square kilometers. They account for an estimated 15 percent of carbon fixed in global ocean, and also impact sulfur and nitrogen cycles. Additionally, they act as nurseries for young fish and other organisms, protect the coastline from erosion, and help maintain water clarity. Published January 27, 2016 in the journal Nature, a European team including researchers from the U.S. Department of Energy Joint Genome Institute (DOE JGI), a DOE Office of Science User Facility, sequenced a seagrass genome: that of the eelgrass Zostera marina, taken from the Archipelago Sea off Finland. Despite the name, eelgrasses aren't true grasses but rather completely submerged marine flowering plants, or angiosperms, and members of an ancient monocot family. To better understand the adaptations the plant made in returning to a saltwater environment, the team compared the eelgrass genome to its freshwater relative, Greater duckweed (Spirodela polyrhiza). The duckweed genome was also sequenced and analyzed by the DOE JGI. Found throughout the northern hemisphere, Zostera marina is the first marine flowering plant to be fully sequenced, work done through the DOE JGI's Community Science Program. As a foundational species in the coastal marine ecosystem, researchers are interested in understanding how the plant—and by extension other plants in the ecosystem—adapts to climate change. In adapting to an underwater lifestyle, eelgrass gained genes that allowed it to live in saltwater but lost genes involved in traits associated with land-based plants. The team was interested in identifying the pathways that underwent major modifications upon Zostera marina's return to the sea. Study lead author Jeanine Olsen of the University of Groningen in the Netherlands called this "arguably the most extreme adaptation a terrestrial (and even a freshwater) species can undergo." Following what she describes as the "use it, lose it, or change it" scenario, eelgrass has modified its cell walls—which are uniquely more seaweed-like—and genes associated with light-sensing, plant defense and signaling, pollination system and regulation of internal water balance. Zostera marina has lost genes related to UV protection and the production of various volatiles including terpenes—hydrocarbons that have applications such as serving as an alternative source of advanced fuels. The team compared the eelgrass genome to duckweed, one of the simplest flowering plants and Zostera marina's closest sequenced relative. They noted differences in genes related to cell wall structure due to adaptations to freshwater or terrestrial conditions. For example, plants such as duckweed have seemingly lost genes that help plants retain water in the cell wall, while eelgrass has regained these genes to better deal with osmotic stress at low tide. "They have re-engineered themselves," said Olsen of the changes affecting the eelgrass cell walls. "Although this has been known biochemically for many years, the underlying pathway that produces these sulfated polysaccharides for the cell wall matrix, in combination with the expansion of low methylated pectins (zosterin), are now unravelled and their strong negatively charged nature is hypothesized to help protect the cells from osmotic stress. Crop breeders may benefit from lessons on how salt tolerance has evolved in these plants." With Zostera marina meadows stretching from Alaska to Baja California, and from the White Sea to southern Portugal, Olsen noted that these ecosystems afford researchers "a natural experiment to investigate rapid adaptation to warmer or colder waters, as well as to salinity tolerance, ocean acidification and light." Learning more about eco-evolutionary interactions is also relevant to the development of genomics-based, early-warning indicators that may foreshadow seagrass ecosystem collapse. Jeremy Schmutz, head of the DOE JGI's Plant Program, emphasized that while eelgrasses are key players in coastal marine ecosystem functions and considered the "lungs of the sea," they are also endangered. 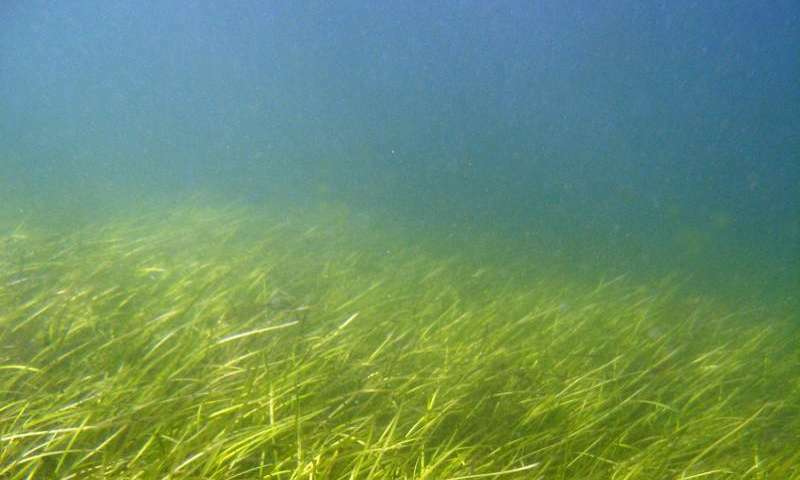 "There are estimates that nearly a third of the eelgrass meadows worldwide have been destroyed by runoff into the ocean," he said, "reducing their potential capabilities as carbon sinks. Thus, studying the adaptive capacity of eelgrass is urgent to assist conservation efforts." Why not delete those genes of seagrass one by one until they turn into duckweed like freshwater limited plant?